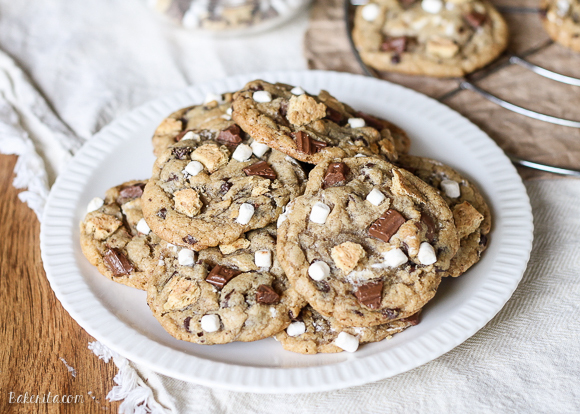 Skip the campfire and whip up a batch of S’mores Cookies! 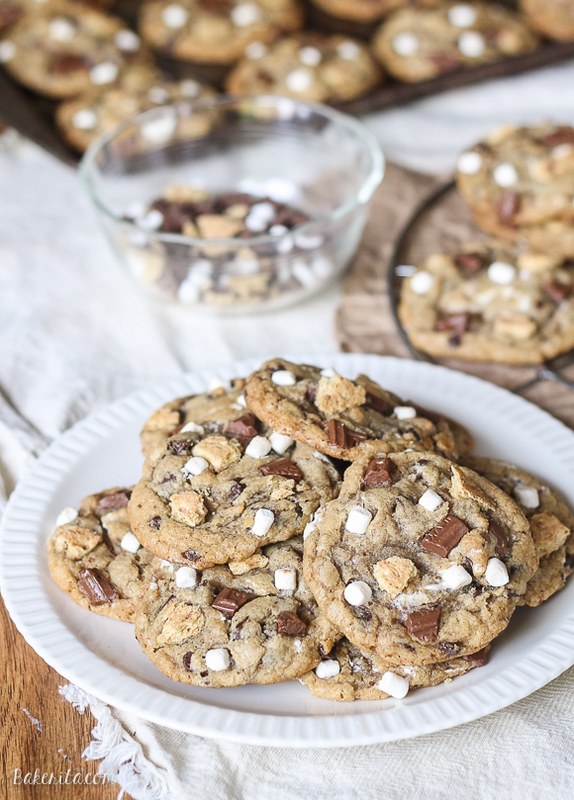 Made with graham cracker cookie dough, chocolate chips & marshmallow bits, these s’mores cookies taste just like your favorite summer treat so you can have s’mores year round. It’s my last Monday as a college student. My last finals week, my last week being able to claim ‘student’ when someone asks about my occupation, my last week living surrounded by people my age. It feels like my last everything. I know, I know – it’s just the beginning. I need to be looking forward to the real world, and getting excited about what lies ahead in the future. For a little while though, I just need to be nostalgic and reflect on the damn good four years that have passed by in a blink. It’s craziness, truly – but what better way to embrace nostalgia, and the past, than with some cookies that will bring you right back to your summertime campfires when you were a kid? 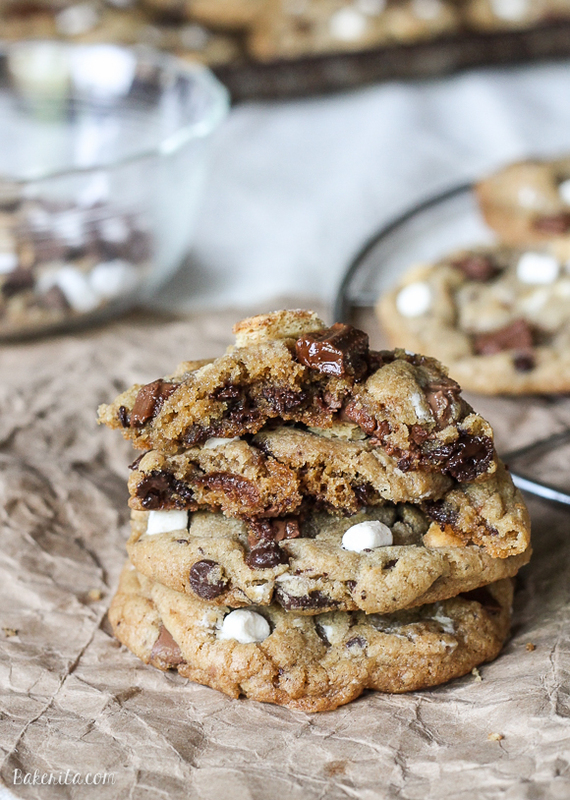 Because seriously, these s’mores cookies do just that. Most s’mores cookies around taste like a chocolate chip cookie with some crumbled up graham crackers, chocolate chips and marshmallows thrown in. The marshmallows usually get weirdly melty and goopy, and the crushed graham crackers barely add any flavor at all. For my s’mores cookies, I wanted the whole darn cookie to taste like a graham cracker. To make that happen, I switched out some of the flour in the recipe for graham cracker crumbs. It totally worked, and the cookies had that graham cracker flavor that I adore with all the softness and chewiness of a chocolate chip cookie. For the chocolate, I hit these cookies with a triple dose. I added milk chocolate chips to give the traditional milk chocolate flavor of s’mores, hit them with some mini semisweet chocolate chips to keep things from getting overly sweet from the milk chocolate, and then garnished with a broken up Hershey’s bar for nostalgia’s sake. Eat the cookies warm for maximum melted chocolate! Let me tell you: marshmallows don’t play well in cookies. I tried making these with mini marshmallows and they melted all over the place. I tried putting a big marshmallow inside and while it made the cookie super chewy, it was also weird and didn’t give the effect I wanted. So…I went with these little Mallow Bits. They don’t melt, and they taste just like the little marshmallows you get in a hot chocolate packet. They definitely do the marshmallow trick in these cookies. Pro tip: use two of these cookies to make a s’more with a toasted marshmallow and more chocolate and I think you’ll probably die and go to heaven. I brought these s’mores cookies to a party with me and they flew off the platter. They’re definitely crowd pleasers, but be sure to snag a few for yourself before they all fly off the plate. You’ll be happy you did. Enjoy! Cream the butter and the sugars until light and fluffy. Scrape down the side of the bowl. Continue mixing while adding the eggs one at time. Make sure each egg is incorporated before adding the next. Add the vanilla. Scrape down the bowl with a spatula. Combine the flour, graham cracker crumbs, baking soda, and salt in another bowl. Whisk to combine. With the machine on low, slowly add the flour mixture. Mix until just combined. With a spatula fold in the milk chocolate chips, mini chocolate chips, and marshmallows. Use a cookie scoop to drop cookies onto a parchment lined baking sheet. If desired, garnish with broken up Hershey's bar, broken up graham cracker, and addition Mallow Bits. Bake for 10 minutes. They should be lightly golden on the outside but still look gooey on the inside. 1 cup of graham cracker crumbs is about 7 crushed graham crackers. I recommend crushing them in a blender to get the finest crumb. Measure after blending. This post contains affiliate links. It is not sponsored. 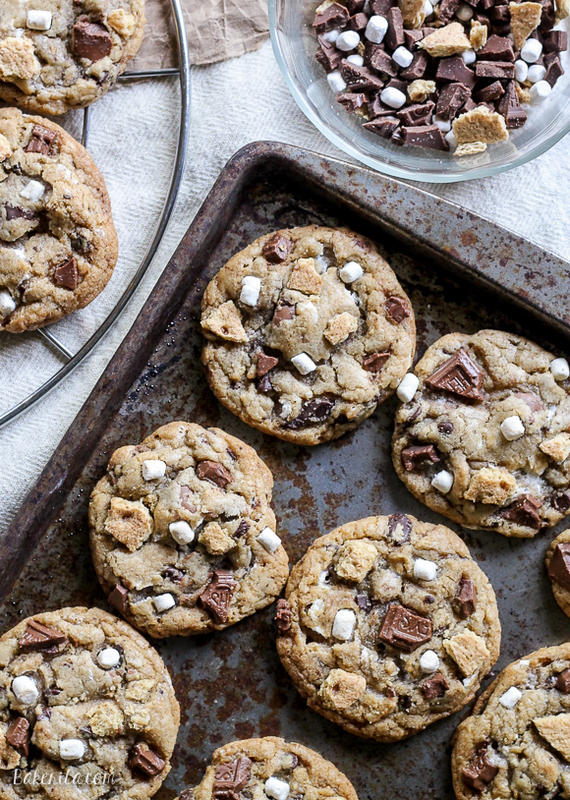 S’more are the perfect way to take you back, and love that you adapted them into cookie form. Congrats to you! These look delicious! Growing up as a vegetarian, at cookouts, s’mores were basically my dinner. Aaaaan d lots of pasta salad. Perfect for summer, yum! Pinning of course. These look heavenly! The perfect way to ring in the start of summer soon! Congrats on almost graduating! These cookies are epic! How brilliant to replace flour with graham crumbs! I think smashing more chocolate and toasted marshmallow between two of these would be positively mind-blowing! Congratulations on the last Monday of college! You totally deserve these cookies! What an absolutely genius idea, love the idea of skipping the camp fire and still enjoying smores. Yummm! Chocolate bits, chocolate chips and mini marshmallows. Heaven I say…. heaven. You are seriously so brilliant! I love that you added the graham cracker crumbs to the actual cookie dough to make it taste like that! S’mores brownies are the best!! I love s’mores everything too :) thanks Shelby! Congratulations!!! That’s SO exciting about graduating! But really scary at the same time… I didn’t know what I wanted to do with my life, so I just dove straight back into college to go to grad school. And when I realized that wasn’t for me 6 months later, I dove into full-time food blogging. People still don’t understand it’s truly an occupation, but oh well. ;) I’m sure you’ll find something that fills your heart and your schedule and earns enough to live off of, and if that’s this blog, then that’s even more exciting! Thanks so much, Amy! It’s definitely nice to at least have this blog while I figure it out…and whatever I do, I would love for it to have something to do with food so I’ll definitely be keeping Bakerita around :) thanks for the words of wisdom! 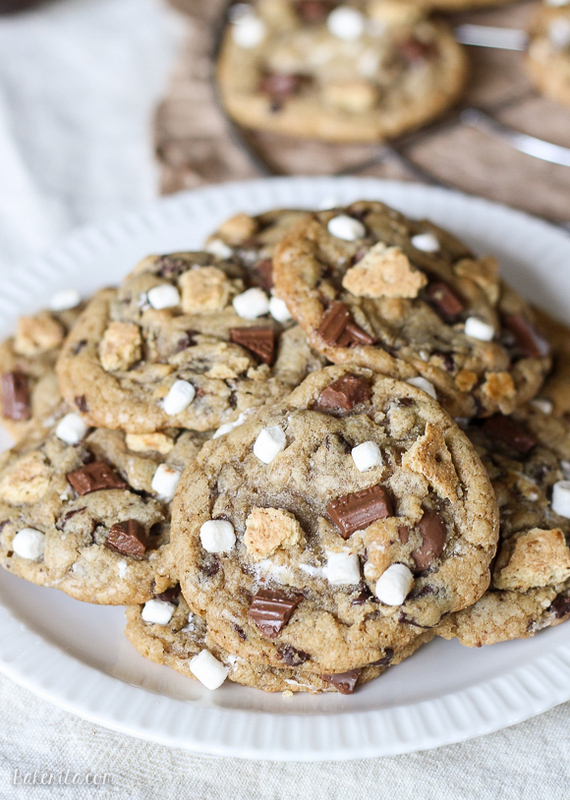 S’mores cookies for life! I could absolutely go to town on these babies. And congratulations on your last days as a student! Oh my gosh yay! So exciting and bittersweet that you’re almost done with school! Good luck on your finals and graduation! Now, about these cookies…I’m obsessed with how soft and chewy they look! Anything smores definitely grabs my attention and I’m pretty much obsessed with these! Rachel you are AMAZING! These cookies are like all of my wildest dessert dreams come true! Rachel, I LOVE these cookies!!!! These are perfection!!! and congrats on your LAST WEEK as a college student!!! That is HUGE!!!! what are your plans after graduation?! Congrats on your last week of school, Rachel! So so exciting! Good luck on your finals and yay for graduation :) These cookies look perfect! Love anything s’mores and making them with the mallow bits and graham cracker crumbs is such a great idea! They sound delicious! Yay for graduation!! Congratulations! I know the feeling your talking about, leaving school is a scary feeling for sure! But you will do such wonderful GREAT amazing things! I can’t wait to see where your journey takes you next! :) And what you bake along the way! Congratulations on your last week as a student, Rachel! Don’t be crazy like me and go back for grad studies…I’m basically a perma-student now (ha ha!) These cookies look wonderful, love that you added the graham cracker crumbs into the cookies. They must taste amazing! You are allowed to be nostalgic. But I’m so excited for you too. A new adventure! These cookies = oh my gosh they look incredible. They are loaded and that’s just the way I like them! I definitely understand the nostalgia, but congratulations! And good luck with whatever you do next! These cookie look amazing, I’ve been working on a s’mores related recipe myself so that’s good to know about the different marshmallows not working! Ooooh man! These look too good right now! I want to reach through my screen and grab one! These cookies look insane! Love the s’mores! So good, definitely need to try these soon! This is a perfect cookies recipe. Your S’mores Cookies recipe looks very delicious especially with awesome graham cracker crumb, it attracts me. My mother will surely like this delicious recipe, good for summer.. I am excited to make this for my family also. Can’t wait to taste it and share this to my friends. Thanks for this good recipes. Amazing! I am dying to make these but apparently we don’t have dried marshmallow bits in Canada! But I don’t give a hell, I will import them at any cost to try this recipe. PS great picture, they are very sultry-looking cookies. I would definitely take them home with me. To bed…..with a glass of milk and a snuggie. Haha, I have never heard my cookies described as sultry but I LOVE it! Such a bummer you guys don’t have bits! Mini marshmallows would work – but they would definitely look different and the marshmallows would have a different texture. Thanks, Katie! I made these yesterday. I think there are three left! They were delicious!!! I did make one substitution -I couldn’t find the marshmallow bits so had to use minis. Thanks for a great recipe! I have a deep love for smores so when I saw these cookies I knew I had to have them. I made them gluten free-just substituted gf all-purpose flour and graham crackers (I used Pamela’s brand)-and they came out perfect! Some of the best cookies I’ve ever made. These are the most gooey, soft, and yummy cookies ever made! The mallow bits didn’t get stuck to the pan, unlike regular marshmallows but once you bite into them they will get really gooey. So much less messy than regular smores and they taste 100x better! Great for summer cook outs! I didn’t have time to put the extra topping on but the still looked great. This might be a silly question, but the measurement in ounces, is that in addition to (the cups, tsp) or just another form of measurement? thanks! Cant wait to make these! Hi Amanda, it’s just another way to measure if you prefer to do it by weight rather than volume, not in addition to. I have never commented on a recipe before but this one is so good I have to. They turn out completely stunning and the crushed graham cracker mixed in adds a wonderful flavor. The mallow bits don’t melt and they keep that bright white color which add great contrast to the golden cookie. This is my new favorite cookie recipe! Yayy so thrilled you’re loving them, Nicolette! Thanks so much for your feedback. I was wondering if you had a gluten free alternative to the flour that you would recommend for this recipe. I know this is one of your older recipes but I want to try and substitute! Thank you!! they look amazing! Can you tell me the size of the Hershey’s bar specified, since they’re available in many sizes; also, since I have many sizes of cookie scoops, can you tell me either the diameter of the scoop, or the number, which is sometimes on the scoop, such as #40, etc. Or how many teaspoons or tablespoons you used for each cookie so I can determine which size scoop to use. Thank you and I am looking forward to trying this recipe. Hi David, just the standard 1.55 ounce bar! You can really make the cookies any size you want, but I generally use my medium OXO cookie scoop which I believe holds 1.5 tablespoons of dough.